On October 25, 2011, after a very dry summer, a freak rainstorm hit the Cinque Terre, an idyllic string of five Italian Riviera towns. Within four hours, the region got 22 inches of rain — a third of an average year’s total. Because of the topography and the ability of the flash flooding to drain, three of the towns (Riomaggiore, Manarola, and Corniglia) were undamaged, and two were devastated. Much of Monterosso and Vernazza were buried under three meters of mud and left without water, electricity, or phone connections. It was a day residents will talk about for the rest of their lives. I visited on the six-month anniversary of the flood (April 25). In the next week, I’ll share my Cinque Terre experience here on my blog. The day after the flood was hot and dry and everyone came together, starting a winter of digging out and rebuilding. In Monterosso six canals run under six streets to the sea. Debris from landslides filled these up, clogging things so the deluge went over ground. Trees, furniture, cars, buses, and tons of mud and rocks plowed through the city. Water pressure from drain pipes below caused streets to explode upward. Medieval wells in basements became geysers. Rivers of raging mud rampaged down the streets, stranding people, and ultimately leaving shops and restaurants on the main streets of old Monterosso and Vernazza buried. 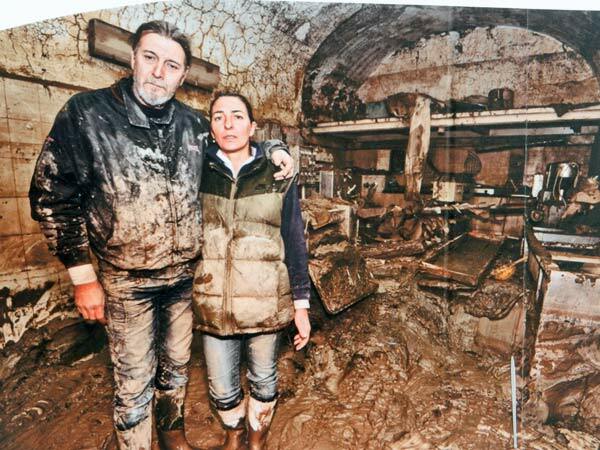 The mud that buried Vernazza on October 25 destroyed every business on its main street. Vernazza's mayor, Vincenzo Resasco, artfully and tirelessly kept the rebuilding of his town on track and people working together. Six months to the day after the flood, he proudly showed me the town's impressive progress. With that first post-flood sunrise, tourists were evacuated, emergency workers came in, and locals rolled up their sleeves and began shoveling. Through the winter there were no weekends as they set out to rebuild in time for the next tourist season. While April 25th, the six-month anniversary of the tragedy, was also was Italy’s Independence Day, and holidays here are normally sacrosanct, everyone was still hard at work. The destruction occurred mostly along former ravines, where, historically, streams ran through the towns. In the last century, the ravines were covered with roads, and the water drained through canals under the pavement that, over time, were not properly maintained. Like congested arteries (made even worse with all the debris that washed into town), the drainage canals couldn’t handle the raging flow. Monterosso’s streets are now repaired. Big new grates allowing ready access to the canals and the sound of rushing water assure townsfolk that the streams are flowing unimpeded below. Vernazza is built around one street (built over the stream in its ravine), with the surrounding hills like a funnel directing flash-flood waters right through the middle of town. After six months, the upper half of town still feels like a war zone, with no businesses open and many apartments and homes still unoccupied. But the harborfront has come back to life. Alpine engineers have been imported from Switzerland to analyze the drainage challenges and put nets above the town to protect it from more landslides. Thankfully, the structural integrity of the buildings is generally fine. While both towns incurred about the same amount of destruction, Vernazza is smaller and more isolated, so a bigger percent was devastated. It was still rebuilding with most of its businesses yet to open. Monterosso, a bigger town with better access to the outside world, was essentially back up and running. Restaurants and businesses at street level in affected areas were gutted and today have replaced everything: tables, chairs, plates, walls lined with bottles of wine, stoves, and so on. 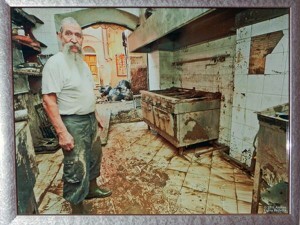 Chef Gino, of Monterosso's Ristorante al Pozzo, shoveled mud through the winter with his family. Now Gino cooks again. While many of his best bottles of wine survived — but with labels obliterated. 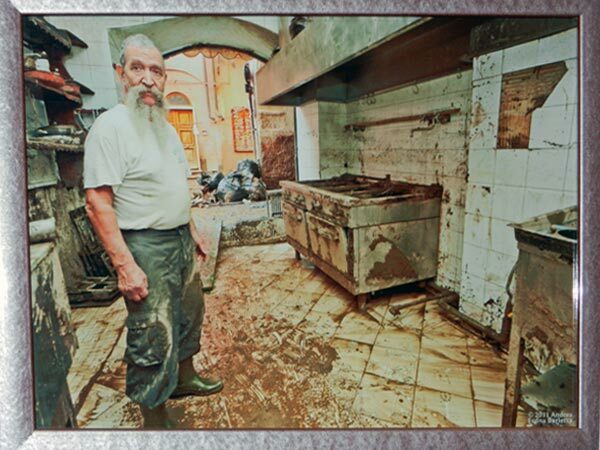 Nearly every business in Vernazza — mostly humble mom-and-pop shops — spent their winter literally digging out. 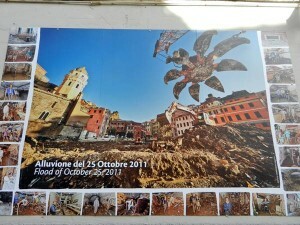 A week or so ago, the president of Italy came to Vernazza in a show of support. The town’s most venerable restaurant, which had just reopened, cooked him the region’s signature dish: pasta with pesto. The president enjoyed it so much, he’s flying the chef to Rome to cook and serve it at the presidential palace. Having been to Vernazza, I’m not certain it’s merchants are humble but I do sympathize with the town. I do believe that Vernazza is like many other places in the world which don’t do enough to plan and prepare to preempt tragedy (like improving its drainage system). 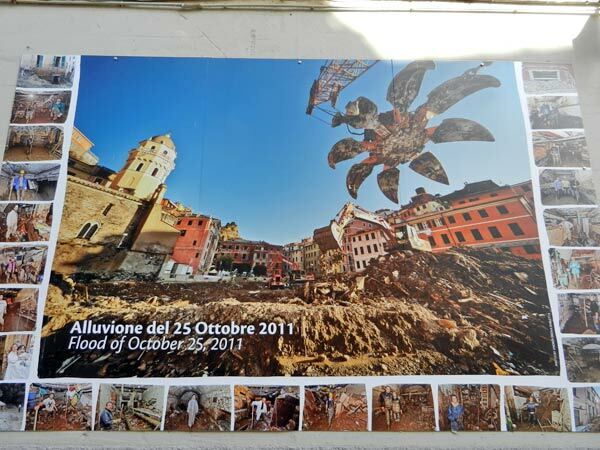 We had our first trip and stayed in Monterosso in 2008, it was so beautiful I can’t even picture this kind of damage. Thank goodness Italians just get the job done. Can’t wait to go back again. We visited all the towns and it was April and I believe that the trail through Cornelia was closed at the time because of excessive rain then. 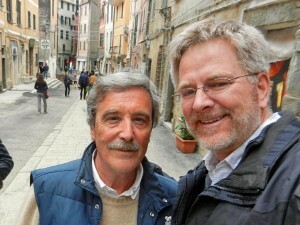 We’ll be visiting the Cinque Terre May21-24, staying in Riomaggiore. Looking forward to seeing whatever we can while there. Can’t wait!